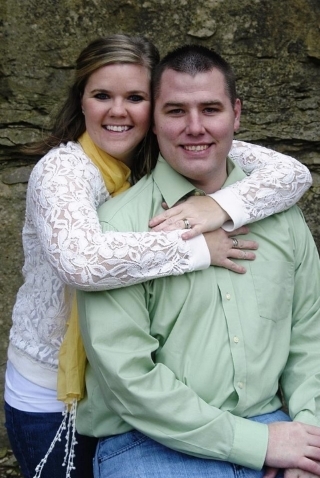 Jeremy and Randi have been serving Maranatha Baptist Fellowship since July of 2009 as the Youth Pastor and in June of 2016 he became the Pastor. Jeremy is a 2008 graduate of Pittsburg State University with a Bachelor of Science in Justice Studies, and in 2012, he graduated from Midwestern Baptist Theological Seminary with a Masters of Arts in Christian Education. Jeremy and Randi met at Pittsburg State University and were both heavily involved with Cross Quest, now Christian Challenge. They have been married since June 2008 and have 2 beautiful little girls. Jeremy also serves as a Police Officer with the Topeka Public Schools Police Department. Randi is a stay at home mom, watching their 2 little girls as well as their 2 nephews and a few other children. Jeremy enjoys fishing, his vegetable garden, and playing with his girls. Randi is an artist whose art can be seen at local coffee shops. "Hi, We are Erick and Lydia Young! We have been married for almost 5 years, and actually met while attending our church homes of Maranatha Baptist Fellowship. We began our journey together by traveling on a mission trip with other members of MBF to Guatemala in 2008. There we helped paint a school and led a Vacation Bible School program to share Jesus with the local children. Since then, we have enjoyed organizing and helping in various ministries at our church. Erick helps with different outreach programs while being the church Administrator. Lydia plays piano on the worship team and helps with the women’s ministry. We feel the Lord is leading our family to grow spiritually and fellowship with others at Maranatha Baptist Fellowship. Where is He leading you?" "Hello. We are Doyal and Vonda Young. We have been members at Maranatha Baptist Fellowship for 19 years. We have been leading a Sunday morning Bible study for about the same amount of time. We have found Maranatha to be an excellent place to experience life with a small group of believers in Jesus Christ and to grow in faith. Perhaps you are one who has for a time grown distant in your walk with Christ. Maybe you are one who is seeking a relationship with God but sometime have more questions than answers. Maybe you just need someone to talk to. We would love to have you join us and just do life together in fellowship with Jesus Christ. We would be happy to just sit and enjoy a cup of coffee with you at our Agape Cafe coffee shop. (Coffee is on us). Hope to see you soon. Jon and Shammie Felps came to Maranatha Baptist Fellowship with the intent of getting married, not looking for a home church. However the Holy Spirit had other plans and they have been with MBF since 2008. Serving and helping with many outreaches and ministries at MBF, Jon and Shammie help provide a fun and enjoyable visit to Maranatha Baptist Fellowship. Barry and Judith have served at MBF since 2008 after retiring and moving to Topeka KS from California where they served in ministry. They have been married since 1968 and have 3 children and 10 grandchildren. Barry is currently serving as the AWANA Club Director, a ministry to our children focusing on hiding God’s Word in their heart. Their goal in life is to serve God in whatever capacity God leads. Both Barry and Judith’s spiritual gift is service which they use within Maranatha’s Body. Eric and Deidra have been members of the Maranatha family since 2004. Eric and Deidra have been married for more than 15 years and have 2 beautiful daughters. Eric is a member of the Kansas Air National Guard as a full-time Aircraft Electrician. Deidra is a Technology Consultant for the State of Kansas. Eric enjoys playing all sorts of games ranging from video games to cards and board games. Deidra is also a member of a local canine search and rescue team. She currently works with her faithful mini Australian Sheppard and enjoys being outdoors working with her dog.